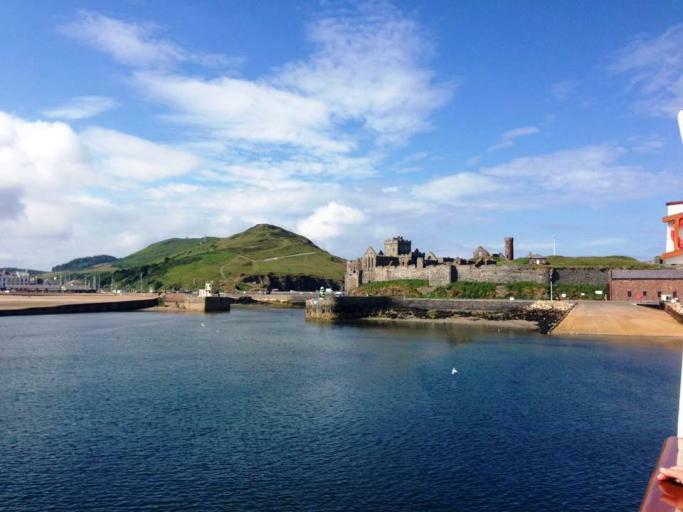 Blessed with an extensive coastline, stunning natural landscapes and unspoilt beaches, the Isle of Man has a unique charm and character. 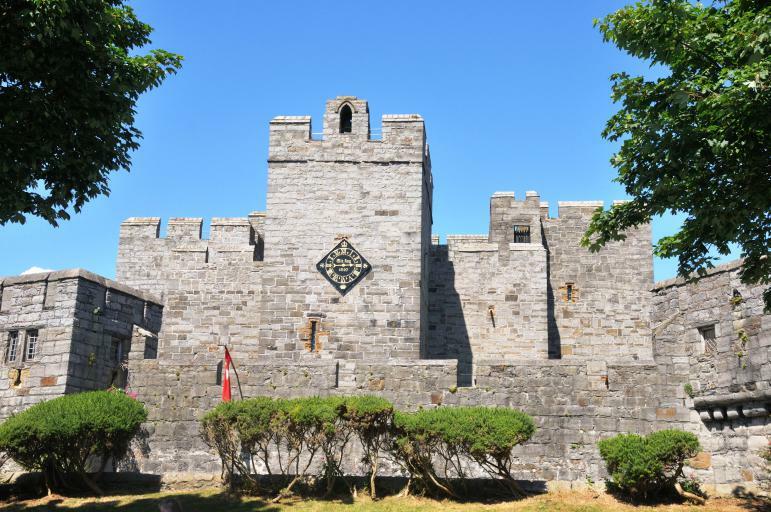 This sea-bound kingdom has a diverse culture and fascinating heritage which stretches back thousands of years. Our voyage captures the magic and mystery of three separate kingdons, all linked by their Celtic and Gaelic ancestry. 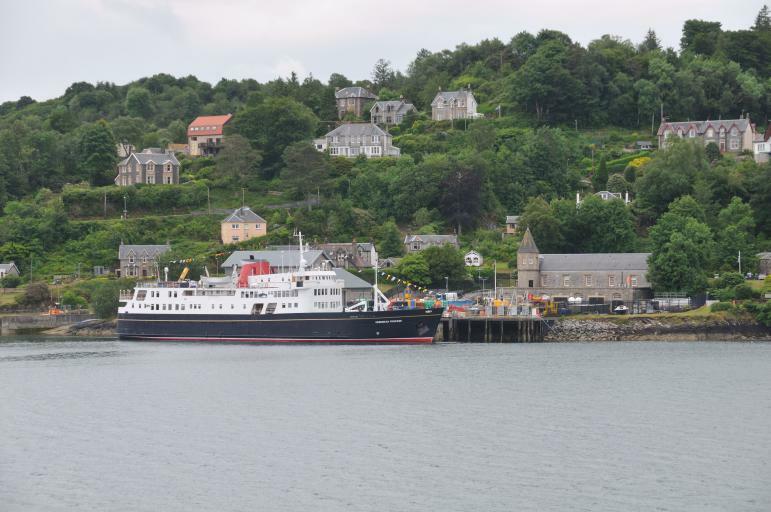 From our anchorage off Craignure we cruised into Oban this morning for disembarkation to take place. Our last morning was spent on the Isle of Jura where guests enjoyed walks from Craighouse along the banks of the loch. 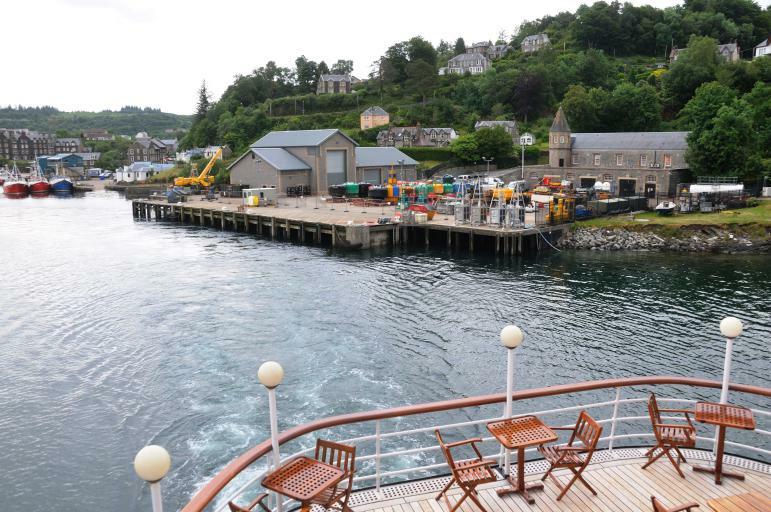 The final afternoon of the cruise was spent relaxing on board as we sailed north towards the Isle of Mull. Our guide Malcolm took the below image of Barnhill which was George Orwell’s house back in 1948 where he wrote the book 1984. On Rathlin Island we visited the bird cliffs of the RSPB Reserve where puffins, guillemots, razorbills and kittiwakes were spotted. 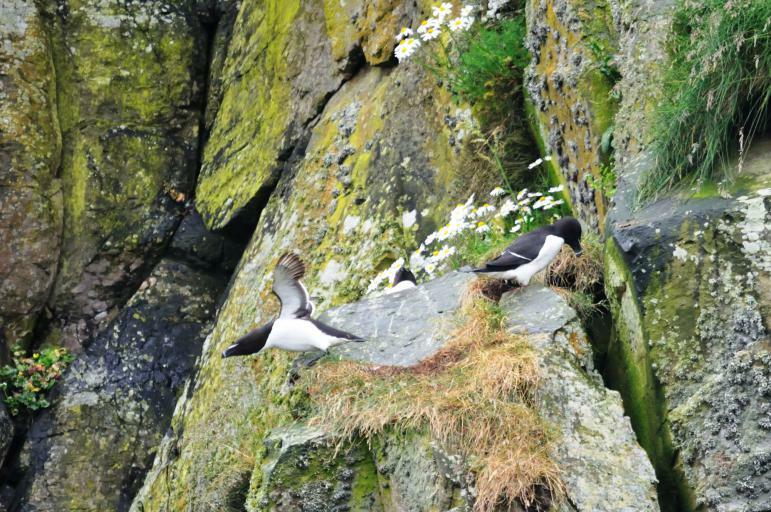 Thanks to Mr Noorani for this image of a Razorbill just leaving it’s cliff face nest. 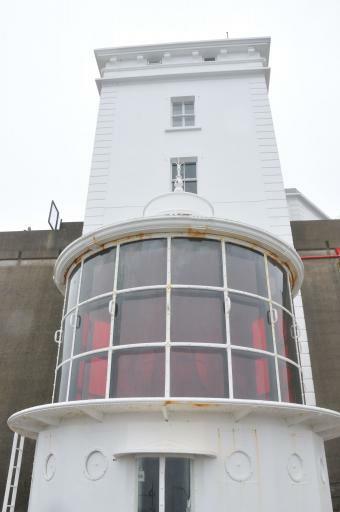 Guests also had the opportunity to visit the West lighthouse, where the lantern room is below the accommodation, due to the fact the clifftop is frequently shrouded in mist. It is also a red light. In the afternoon we sailed to the Isle of Gigha for a visit to Achamore Gardens before arriving at our overnight anchorage in Loch na Mile, Jura. 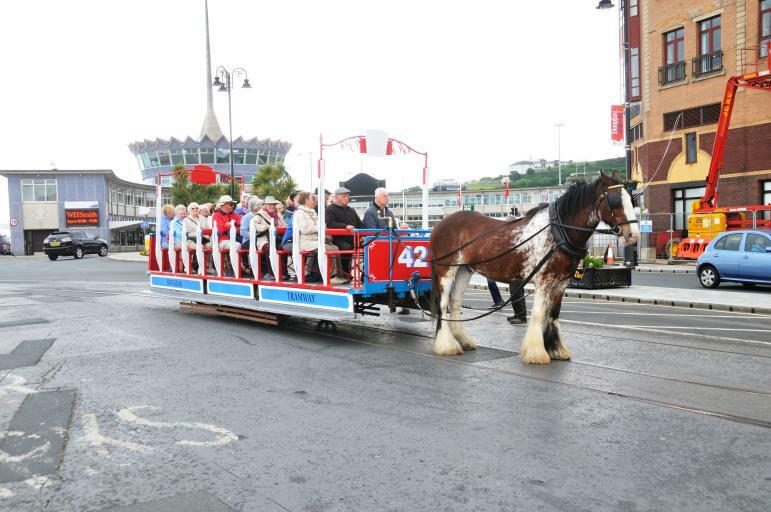 This morning our guests left the ship in Douglas by horse drawn tram to travel to Laxey and the Great laxey Wheel. During the afternoon we departed from the Isle of Man and sailed on passage to Northern Ireland, anchoring overnight off Rathlin island. Our exploration of the Isle of Man commenced this morning with a visit to Peel Castle and the House of Mannanan. 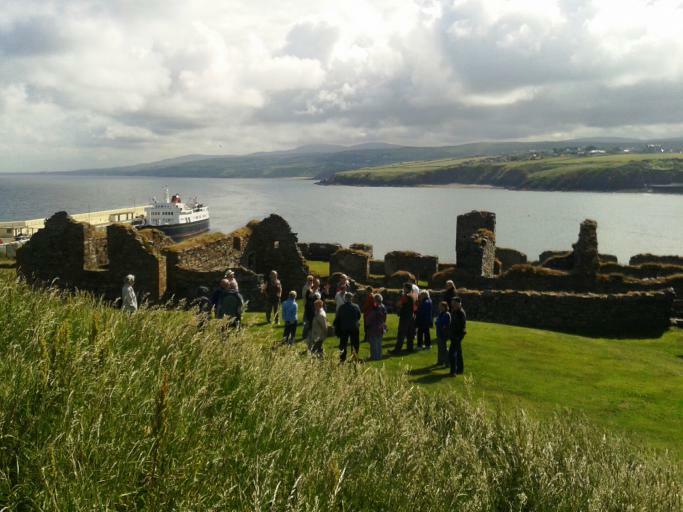 In the afternoon we toured Castletown by coach and returned to the ship via steam train to Port Erin. 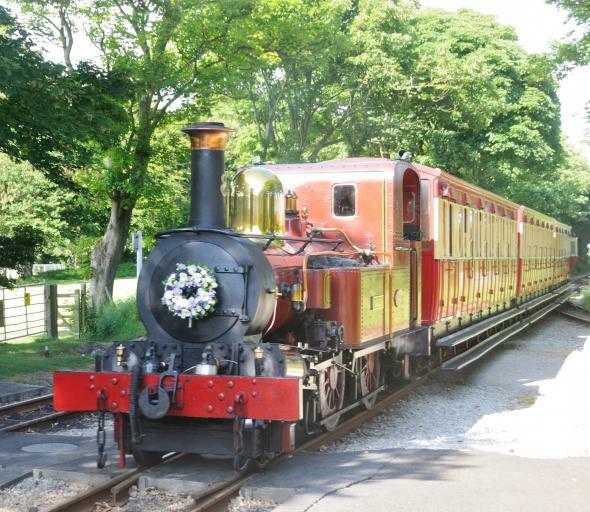 The second image below shows our train arriving at Castletown. The locomotive is number 8 Fenella, built in 1894 by Beyer Peacock of Manchester. The wreath is in memory of Mr Jack Petri who served the Manx railways for over thirty years as a Fireman, then Driver and finally Station Master, Ballasalla, and it was his funeral that day. 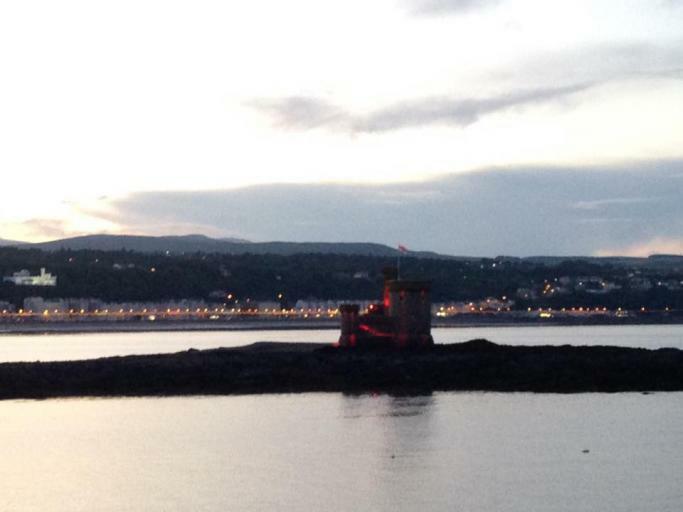 We then sailed to Douglas where we remained overnight. Today was spent in Northern Ireland. 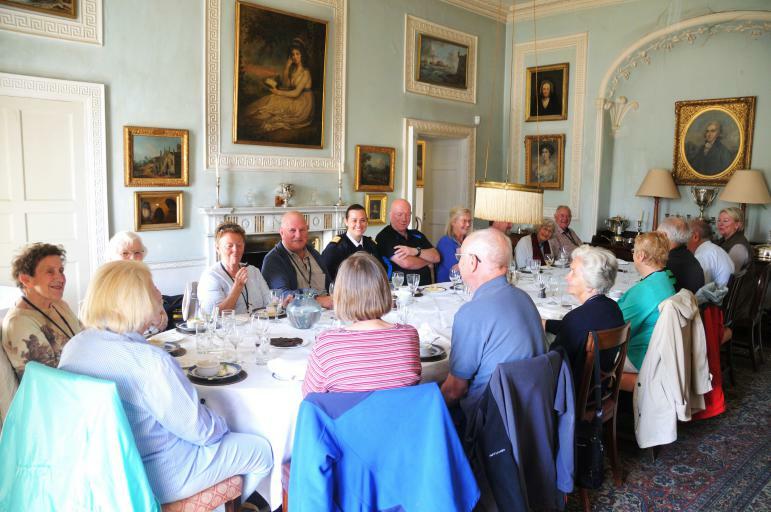 Guests went ashore from Bangor for an all day visit to Grey Abbey House, during which the ship sailed to Strangford Lough where guests re-joined in the late afternoon by local boat. 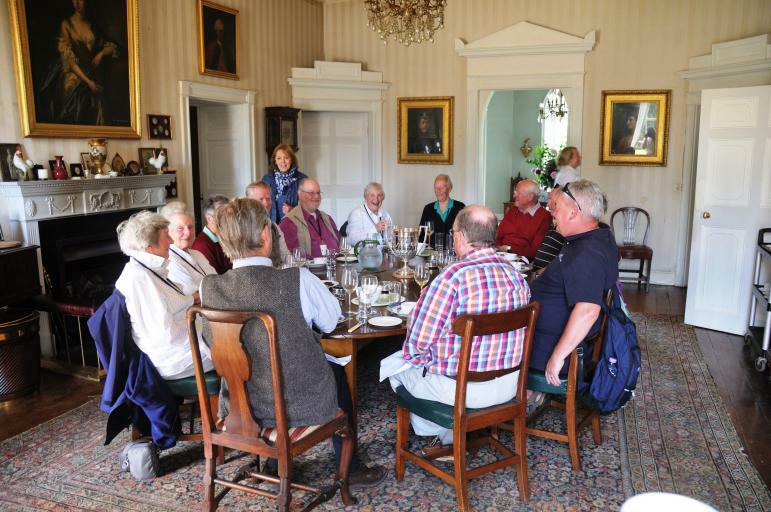 Thank you to John Noorani for the above images of our guests enjoying their lunch at Grey Abbey House. 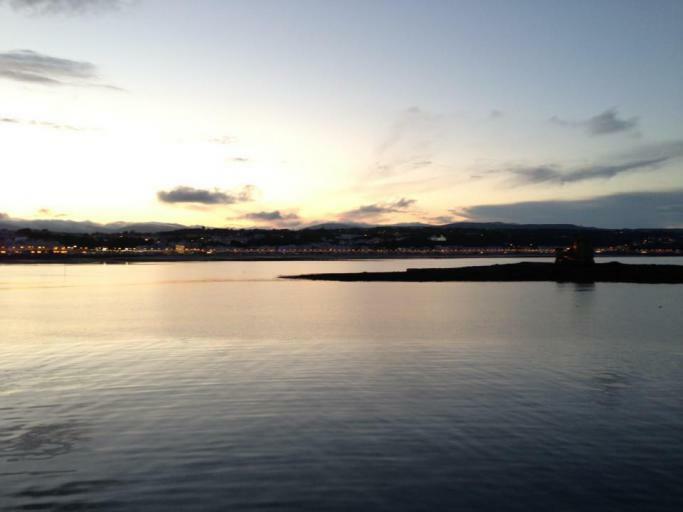 From Portaferry, Strangford Lough we set sail for the Isle of Man, arriving in Peel in the evening and berthing overnight. This morning we went ashore at Port Ellen on the Isle of Islay for a visit to Laphraoig Distillery and Visitor Centre. 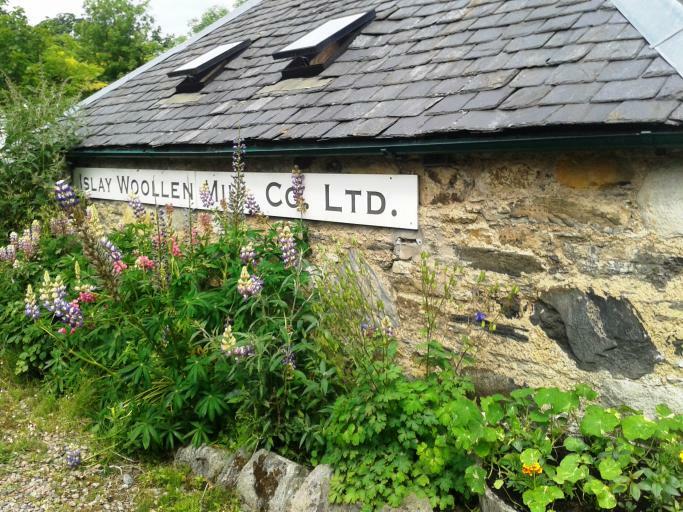 Some guests also visited the Islay Woollen Mill with our guide Malcolm. The afternoon was spent cruising the North Channel on passage towards our overnight anchorage off Bangor Marina. 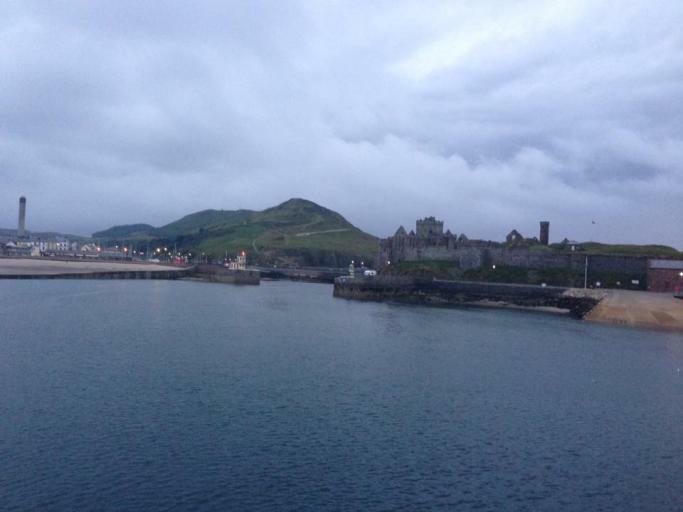 When passenger embarkation and the mandatory safety briefings were complete, we set sail from Oban. through the Sound of Kerrera on passage towards our overnight anchorage.